Guy Warren was born in Goulburn on 16 April 1921. As a child the family moved to Sydney and Guy grew up in the eastern suburbs & northern beaches. He left school at 14 to pursue his love of art and worked in Sydney at The Bulletin magazine and started formal art training part time at the J.S. Watkins Art School. His epiphany came after volunteering for the AIF in 1941. He trained in the rainforest of Queensland, fell in love with it and then became overwhelmed by the mysterious beauty of Bougainville where the indigenous people decorated their bodies so that they could disappear and reappear at will. This became the liet-motif of his vision and the essential metaphor for him of the quintessential secret of painting: a notion of nature’s camouflage within which questions of our existence may be hidden and found. Warren studied at the National Art School as a rehabilitating soldier, and in 1950 married an English girl Joy and went to live in England where they stayed for eight years. Joy became a distinguished academic and ceramicist working until her death in 2011. Guy became a close friend of the distinguished art scholar and critic Norbert Lynton who later wrote a long introduction to his monograph – In search of Gaia (2003). But the most intriguing British encounter was with the young David Attenborough. After seeing a BBC TV production depicting decorated native dancers of the New Guinea Highlands Guy wrote to the BBC requesting some still images and was put in touch with Attenborough who loaned many photos in exchange for a painting. 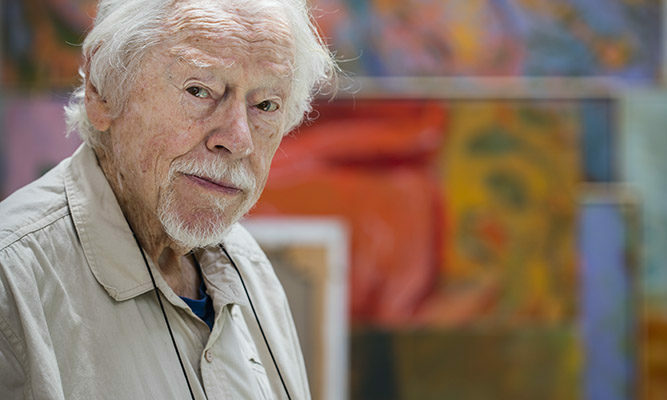 After return to Australia in 1959 Guy pursued, along with his painting, a successful career as editor, writer and teacher. He was, and still is, exceptionally articulate as a speaker and writer, and warmly magnanimous, one could even say sage-like, in his appreciation of fellow artists. The exhibition, curated by Barry Pearce, Emeritus Curator of Australian Art, AGNSW, was inspired from a visit to the artist’s studio as Warren reflected on his growing sense of mortality and was considering how to disperse his work. Discovered in a stack of paintings in the corner were paintings of the 1950s from his London years and 1960s soon after his return to Sydney. The evident qualities of these works and the obsession with emergence and submergence of the figure in relation to its background, has resonated throughout his oeuvre to the present day. This special focus exhibition features work from his earliest days in London during the 1950s and after his return to Sydney in 1958, together with recent works which show the enduring imagery of the relationship between the figure and background that signifies not only a timeless aspect of the language of painting but also the mystical connection between man and the environment.